Jared Boll and Dalton Prout are two of the Blue Jackets adding a new technique to their workout regimen. 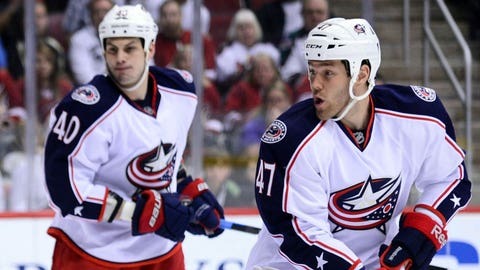 Blue Jackets forward Jared Boll likes to mix things up when it comes to his conditioning. He’s worked out with Navy SEALS and tried mixed martial arts and boxing. But the latest addition to his workout routine may surprise some — Boll has become an avid student of yoga. Over the summer, Jackets strength and conditioning coach Kevin Collins listed yoga as a recommended activity for players to do as light recovery from workouts. Boll was coming off a year plagued with injuries in which he was only able to play 28 games in the regular season, so he took the suggestion and ran with it. "I’ve had back problems for years now, and we’ve tried everything," Boll said. "I heard that yoga was good for your core and back and I thought it couldn’t hurt, so I gave it a shot." 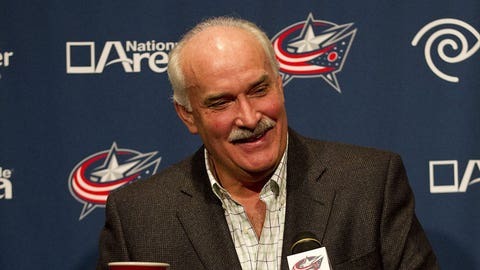 Boll didn’t want to go by himself so he grabbed some of the other Jackets players spending the summer in Columbus and took them to a yoga class in Dublin. In the midst of a classroom full of seasoned yoga practitioners, the Jackets players took a place in the back to try their hand at yoga. They quickly found out it was quite the workout. "Some of the girls in the class gave us a bit of teasing that big tough hockey players can’t make it through an hour yoga session," Boll said. "It’s unbelievable how good they are at it and how hard it really is." One of the guys who joined the summer yoga sessions was defenseman Dalton Prout, who Boll says is always game to try new things. Having signed a two-year contract extension in the off-season, Prout is anticipating the long-term gains that yoga can bring to his play. "Yoga is something that is going to help you past Christmas, something that will help you stay fresh and not feel so tight," Prout said. "It’s important to do (yoga) now even when you feel good to get the benefits later." After a summer of classes, Boll showed up with a marked change in his body that Collins noticed and Boll shared how much the yoga training had helped him. Enthusiastic about the players’ interest, Collins was able to get management’s approval to hold optional yoga classes for the entire team once a week. 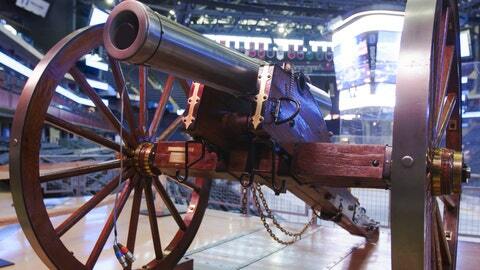 The Blue Jackets cannon is a big part of the team's identity. Alison Lukan details how it came to be. "You never know what these guys are going to get into," Collins said. "A lot of times you get stuck in your workout routine, so adding yoga is definitely beneficial for flexibility and performance." Collins has worked with the same instructor Boll and the other players went to in the summer to plan classes geared specifically to the needs of hockey players. The classes the team hosts each week focus on exercises that open the hips to address the demands on those muscles from all the skating in practices and games. Collins hasn’t been to all the classes but he says watching a few has helped him pick up things to work on with different players based on exercises with which they struggle. "You can go back and focus on areas where guys may have trouble by adding exercises to their warm-ups or workouts," Collins said. "And you see some guys taking the (stretches) from class and doing them on their own — it’s going to be great for flexibility, injury prevention and core strength long term." According to Collins, over half the team is participating in the optional sessions. This has impressed not only the coach, but also the players who first started their yoga practices over the summer. "I’m surprised it’s caught on in the organized fashion," Prout said. "Lots of guys do whatever works for them but to do it all as a team is fun and I’m surprised how well it’s doing." Boll agrees. He’s played in all five games this season and says he’s never felt better. In addition to helping his back pain, Boll notices the impact yoga has made on improving his balance and stability. "The first time I went I didn’t want to go back because it was so hard," Boll said. "But it’s really helped. Even though I don’t think it’s for everyone it’s working out really well for me." As much as they enjoy it, the players can’t remember the names of all the poses they practice. Prout says his favorite is "pigeon" while Boll jokes that what he enjoys most is the resting pose at the end of class. "It’s all about variety and adjusting to your body," Boll said. "The guys are trying it and liking it — it’s brought variety to our workouts and it’s been great."